This week, we have good news concerning WEMOVO again. But read for yourself! 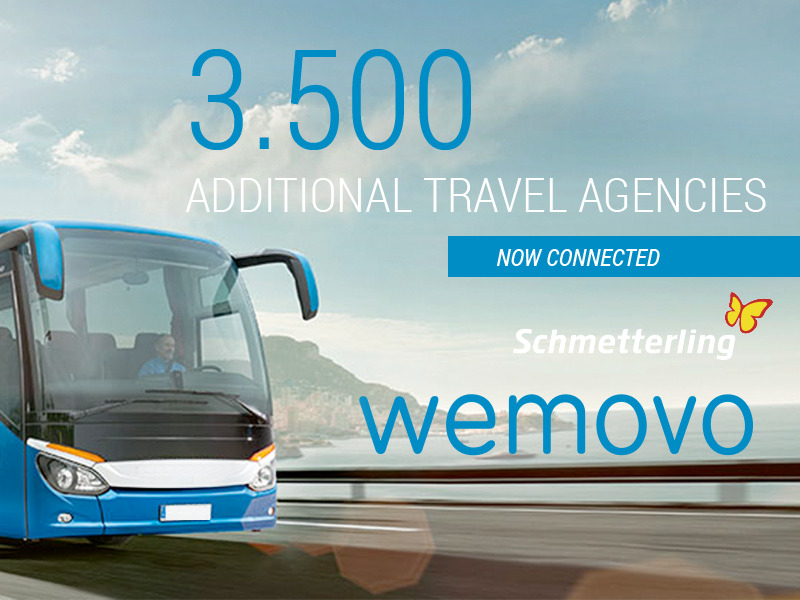 We are very happy that SCHMETTERLING REISEN is now a partner of WEMOVO! Through this partnership, WEMOVO may now access 3,500 stationary travel agencies, most of them (approx. 3,000) in Germany. The fact that one of our existing customers, a coach operator, invested €5,000 during our Companisto campaign proves that our service provides coach operators and travel brokers with a significant advantage. This coach operator had already purchased our GOLD package before. We are really pleased about this customer's display of trust! Our clear goal is to expand our network of coach operators. As a reminder: In 2013, the German coach travel market was finally liberalized. Consequently, it is now possible that new long-distance coach lines are created anywhere in Germany and that these lines compete with one another and with railroad companies. Immediately after liberalization, the then nonexistent long-distance coach market was suddenly booming. Between 2012 and 2013, the number of German coach travelers increased from 3.0 million to as many as 8.2 million, which corresponds to an increase of almost 180 %. According to a press release by fernbusse.de, this number increased even further to almost 20 million coach travelers in 2014. And WEMOVO plans to become the Amadeus of the coach travel industry. Amadeus is a booking system for airlines, hotels, and rental cars whose network consists of approx. 400,000 travel brokers in the digital and stationary segments. As this is a very lucrative business and as global travel is constantly increasing, Amadeus is generating considerable revenues, which came in at €3,417.7 million last year according to the company. Profit in the same period amounted to €681.1 million (adjusted profit of the reporting period, including M&A activities). However, the Amadeus portfolio does not include any coach operators yet. Potential exit partners are essentially looking for both a sufficient offer (i.e., a sufficiently large number of coach connections) and the necessary technology. WEMOVO offers both of these things.